The American Agricultural Economics Association meets in Portland, OR, from Sunday through Wednesday. My term is just ending as chair of the association's Food Safety and Nutrition Section. Here (.doc) is information about the business meeting and the track of sessions we organized this year. If you are attending the conference, do accept a warm invitation to come to these events and meet some scholars who care both about economics and about the practical policy problems of nutrition and food safety. The Kind-Flake amendment was defeated, of course, and the Farm Bill passed the House. This Farm Bill has been a great education in the cynical economist's view of public policy decision-making. The bill's supporters perfectly gauged how much funding for nutrition, conservation, and fruits and vegetables it would take to split the advocacy coalition that would otherwise have demanded reform to the traditional row-crop subsidies. The House Agriculture Committee had to make some adjustments to conservation programs and agricultural insurance programs that will anger some Senators who support those programs. Still, it is hard to imagine this bill failing or even changing much at this point. Perhaps in five years, under the influence of this bill, rich farmers will be even richer, small family farms will be even fewer, and farmers in developing countries will be even poorer. Look on the bright side. We can all hope for reform in Farm Bill 2012. In ordinary times, public interest groups have a fairly free hand to advocate for all good things. A better environment. Less government waste. More nutrition. Lower taxes, perhaps. At crunch time, by contrast, they must make difficult decisions. The priorities of public interest groups as the Farm Bill finally reaches the floor of the House of Representatives are telling. Let's take a look at their websites today. A wide range of public interest groups oppose the bill passed by the House Agriculture Committee, saying it does not reflect reform. Several of these are pressing hard for adoption of the bi-partisan Kind-Flake "Fairness" amendment, which would limit payments to wealthy farmers and re-allocate a fraction of current row-crop subsidies toward environmental and nutrition priorities, while also reducing the federal deficit. The faith-based anti-hunger group Bread for the World goes all out, with suggestions for letters to legislators and a personal video appeal by the group's president David Beckmann. Oxfam America likewise puts support for this amendment on the front page. The Environmental Working Group and Environmental Defense support the Kind-Flake amendment. Others, including the Food Research and Action Center, the leading national advocate for nutrition assistance programs, support passage of the Farm Bill without mentioning support for this amendment (that I could find). The front-page alert on FRAC's website points out that House Rules Committee member Jim McGovern (D-MA) has apparently won some funding successes for food assistance programs late in the process, and now supports the House Agriculture Committee's bill. Changes to the rules for debate are described as threats, because the amendments permitted for consideration under the rules recommended by the Rules Committee do not threaten the nutrition programs. FRAC encourages supporters to write legislators and ask them to resist amendments that would harm the prospects of the nutrition program funding, without listing particular amendments to oppose. Although it might seem perhaps a parochial concern, in a Farm Bill costing many tens of billions of dollars, the Community Food Security Coalition website has a top-of-the-front-page appeal to make sure that $5 million in community food project funding is mandatory rather than discretionary. As of 5:30 pm, Farm Bill debate on CSPAN is just starting. An independent analysis by leading agricultural economists this month shows that the commodity provisions of a Farm Bill reform proposal rejected by the House Agriculture Committee, called "Farm 21," would save $21 billion in government spending over five years. 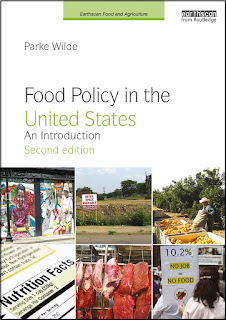 See the report (.pdf) from the Food and Agricultural Policy Research Institute (FAPRI). The commodity provisions of "Farm 21" would reduce net farm revenue by $19 billion over five years, but the farmers would make some of this money back in reduced rent to non-farmer landowners. Farmers would also benefit from other provisions of the proposal that were not counted in this estimate, including improvements to nutrition and conservation programs. The "Farm 21" proposal makes sense to strong proponents of Farm Bill reform, but even with the rental savings, increased demand through nutrition programs, and conservation payments, it is easy to see why it has been a hard sell in farm communities. As a consequence, the proposal's long-time sponsor, Rep. Ron Kind (D-WI), has recently been working with other legislators on a more "politically practicable" amendment to the largely non-reformist bill passed by the House Agriculture Committee last week. Early reports suggest the new "Fairness Amendment" preserves some of the strong reform elements, gives ground on others, and incorporates some administration reform themes for bipartisan appeal (see FarmPolicy and the Ruminant). Keep an eye on the Fairness Amendment as the Farm Bill approaches an unusual struggle on the floor of the House. Right. Okay. We'll take her off the list for free lamb. Dan Owens at the Blog for Rural America traces some misleading talking points as they wind their way through the conventional wisdom, and slams "The 'Reform' that Wasn't." Dan Morgan, writing at FarmPolicy.com, points out that the U.S. business community, outside of the big farm lobby, wants real subsidy reform. The Washington Post covers a GAO report showing that $1.1 billion in USDA subsidies over the past seven years went to the estates and families of deceased farmers. In a letter, USDA responded that these payments did not necessarily indicate fraud or abuse. According to the Post, "The department's field offices defended the practice of routinely paying dead farmers' estates without fully investigating the claims, citing staff shortages and competing priorities." See the Post's full series of articles, Harvesting Cash. The Farm Bill passed by the House Agriculture Committee on Thursday is not reform. It includes some new subsidies for fruits and vegetables, but still tiny compared to the many billions for traditional row crops such as soybeans and corn, which are mainly used as animal feed for meat and dairy production. It includes an effort to cap subsidy payments to some millionaires (! ), but there is less to that cap than it appears. There are loopholes, and the proposed bill steps backward on subsidy reform in other respects. The measure, acted on by a voice vote, stops well short of the wide-scale changes called for by critics of current policies. A key question is whether House Speaker Nancy Pelosi (D-CA) will support Agriculture Committee Chair Collin Peterson's (D-MN) bill. Early reports had Pelosi describing the bill as "reform." See the reports from the Blog for Rural America, the Jew and the Carrot (where our own contributor Aliza Wasserman writes), and FarmPolicy. 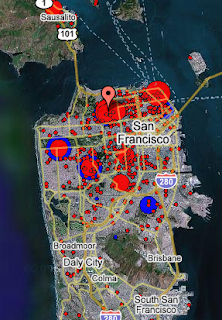 I liked this image from Mulch, which illuminates the dynamics between Pelosi and Peterson using a Google Maps graphic, which shows the approximate location of subsidy recipients whose address is in San Francisco. General Mills and other major cereal makers will follow the lead of Kellogg and limit advertising of breakfast cereals on children's TV shows, unless the cereals meet certain nutrition criteria (see Brooks Barnes in the New York Times today). One loophole -- which the news reports noticed -- is that the manufacturers will continue to advertise sugary cereals on family shows, such as American Idol, which actually have a larger audience of young children than the so-called children's shows do. Another loophole -- which the news reports did not notice -- is that the manufacturers are using tricky numbers. They declared that they would not advertise products with more than 12g of sugar per serving on the children's shows. But, they use smaller serving sizes for some high-sugar cereals, such as Cocoa Puffs, so that these cereals appear to meet the standard. Trix are no longer for kids — at least not on children’s television shows. But Cocoa Puffs are another matter. Trying to persuade critics the industry does not need government regulation, 11 big food companies, including McDonald’s, Campbell Soup and PepsiCo, have agreed to stop advertising to children under 12 products that do not meet certain nutritional standards. Some of the companies, like Coca-Cola, have already withdrawn all such commercials or are in the process of doing so. Others, like General Mills, said they would withdraw them over the next year or so, while a handful agreed to expand their self-imposed bans to radio, print and Internet advertising. Still, the agreements will probably amount to a ripple rather than a sea change in terms of what foods children see pitched on their favorite television shows and Web sites. For example, while General Mills will no longer be advertising Trix to the 12-and-under crowd, it will continue to peddle Cocoa Puffs, which have one less gram of sugar per serving. On the General Mills website, Cocoa Puffs appear to have 12g of sugar, which would barely meet the standard (click for larger image). 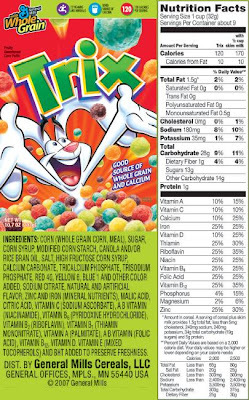 Meanwhile, Trix appears to have 13g of sugar, which would exceed the standard (click for larger image). But watch out. General Mills' Cocoa Puffs label uses a serving size of 27g, while the company's Trix label uses a larger serving size of 32g. Using the government's customary serving size of 30g for Cocoa Puffs and Trix, both cereals exceed 12g per serving. 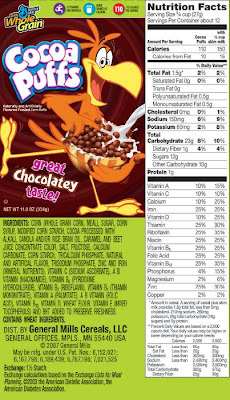 See these links to labels for Cocoa Puffs (14g sugar) and Trix (13g sugar) on the NutritionData website. By using a smaller serving size, General Mills made the amount of sugar in Cocoa Puffs look smaller. Really, Cocoa Puffs have more sugar than Trix. What does it say about the voluntary guidelines that Cocoa Puffs will still be peddled to your kids on children's television? See FarmPolicy and Ethicurean for coverage of today's hearing in the House Agriculture Committee, or listen to the streaming audio yourself. Meanwhile, I am fascinated by efforts to crunch the numbers and fashion a Farm Bill reform proposal that benefits a majority of Congressional districts that are represented on the House Agriculture Committee. You can see the appeal of this question. Of course, urban and suburban districts would benefit from reform, but their legislators do not care enough to spend political capital on this issue and they do not sit on the House Agriculture Committee. The clever question is to ask what combination of fruit and vegetable subsidies, conservation payments, rural development projects, and community food programs should win the votes of a majority of legislators on the committee. See this post from the Blog for Rural America and this post from the Ruminant. New York City's rule requiring calorie counts on fast food menu boards may turn out to be more important than the city's new ban on most trans fats in restaurants, which originally received more media coverage (see earlier post). Currently, the restaurant industry is battling to convince the courts that calorie counts on menu boards are infeasible. 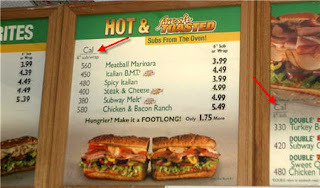 To the rest of the industry's embarrassment, Subway's proposed menu board showed that the calorie column is feasible and unobjectionable, from the perspective of a fast food restaurant with little to hide. ... which prompted New York City's Health Department to have its own artist show how easily Dunkin Donuts could have succeeded if it had wanted. For the latest news, see the posts on the Consumerist (1) (2) and the brief filed yesterday by the Center for Science in the Public Interest (CSPI), with signatures from some of the most prestigious health policy organizations and scientists in the country. There are many perspectives about whether the Internet is dividing us or uniting people and communities. Food activists tend to fall on the side of communitybuilding. "It used to take days or even weeks to get the word out about an issue or rally," one organic food activist told me several years ago. "Our new weapon is e-mail. We can mobilize people in hours now. It's powerful -- and, believe me, we need it." That activist, Chicagobased Jim Slama, and his green public relations and marketing firm, Sustain (sustainusa.org), were central figures in convincing U.S. consumers to send more than 275,000 e-mails and postings to the Department of Agriculture in 2000 to take exception to the proposed National Organic Standards. Before then, organic certification was more in the hands of food activists who wanted to discourage the use of pesticides and other chemicals in plants. The private National Organic Standards Board was adamant that the proposed rules would allow irradiated and/or genetically engineered foods to qualify as organic, plus sewage sludge would be acceptable for watering any "organic"-label food. But those 275,000 comments worked, thanks in large part to Slama and other activists spreading the word about an extended public comment period. The USDA couldn't neglect the number of comments (and prospective voters) no matter how many lobbyists might be knocking on their doors. By 2001, the final organic rule was passed after reinstating prohibitions on irradiation, genetically modified seed and that nasty sewage sludge. Sustain's project on family farming, FamilyFarmed.org, was recently chosen at the NetSquared conference as one of 21 public interest projects for future funding and mentoring from leading social networking experts in Silicon Valley. 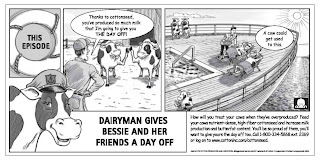 A student forwarded this cartoon, which reminded me of an earlier dairy advertising campaign featuring "happy cows," which was the subject of a lawsuit by animal rights groups. In an ironic twist, the federal government's cotton checkoff promotion program (funded by $55 million per year in government collections from cotton producers) is using the cartoon below to sell its cottonseed oil products to the dairy industry (whose own federal government checkoff programs are funded by $105 million per year in government collections from producers for fluid milk and another $273 million per year for other dairy campaigns). The cartoon's tag line, designed to appeal to dairy farmers, is: "How will you treat your cows when they've overproduced?" It's a good question. U.S. Magistrate Judge Deborah Robinson on Tuesday sentenced former FDA commissioner Lester Crawford to three years of supervised probation and ordered him to pay fines of about $90,000 for false reporting and conflicts of interest related to ownership of stocks in companies regulated by the agency, the AP/Washington Times reports. Zheng Xiaoyu's execution was confirmed by State Food and Drug Administration spokeswoman Yan Jianyang at a news conference held to highlight efforts to improve China's track record on food and drug safety. Hugh Joseph calls for "A Pro-Food Farm Bill"
How do we strengthen the "food" components of the farm bill? We could support supplementing school meal programs with hundreds of millions of dollars of additional fresh fruits and vegetables. This would encourage children to eat better, and open up large new markets for local and regional farmers. A stumbling block is the Department of Agriculture, which has told local school districts that they cannot give a preference for food purchases to local farmers. Massachusetts currently benefits from USDA programs that promote local foods. Community Food Projects, started a decade ago, has funded 18 projects across the Commonwealth with grants up to $250,000 to support innovative anti hunger and nutrition programs that link to local food production and marketing. But the program receives only $5 million a year nationally. The $30 million authorization currently proposed in the House agricultural subcommittee would have a commensurate impact on our food producers and consumers. Massachusetts also started the Farmers' Market Nutrition Program two decades ago, a program providing $20 million this year to WIC families nationwide to obtain fresh produce at local farmers' markets. A similar program for seniors is currently funded nationally at $15 million. A three- or four fold increase would help address the enormous unmet demand in Massachusetts and other states for these benefits at a tiny fraction of what is now spent to support large commodity producers. The 2007 farm bill should encourage farm stands and other direct marketing links with consumers, and foster urban food growing, school gardens, and local food procurement efforts by institutions. It should also strengthen the Emergency Food Assistance Program and other food and nutrition assistance programs such as the Food Stamp Program, WIC, the Fresh Fruit and Vegetable Program, and the Commodity Supplemental Food Program. These are front line defenses to prevent hunger and food insecurity while promoting nutritional health, particularly among children, older adults, and families at highest risk. Will biofuels starve the poor? By putting pressure on global supplies of edible crops, the surge in ethanol production will translate into higher prices for both processed and staple foods around the world. Biofuels have tied oil and food prices together in ways that could profoundly upset the relationships between food producers, consumers, and nations in the years ahead, with potentially devastating implications for both global poverty and food security. Ethicurean links to Will Saletan at Slate and the Washington Post, who dissents ... er, half-dissents. True, biotechnology can go wrong. But it can also go wonderfully right. Scientists are learning to split corn so it can make ethanol and still feed animals. We're studying the use of microbes to extract fuel from straw and wood waste. We're trying to grow biofuel in algae. We're even learning to make fuel from animal fat and excrement. Yes, ethanol subsidies are a scam. Yes, we should drop our trade barriers and let Brazilian sugar cane wipe out American corn. Yes, we need solar power, conservation, and efficiency. But don't give up on biofuel. It just needs time to grow. The Food and Drug Administration (FDA) on June 25 announced new rules for the manufacture of dietary supplements, which will help ensure that they they have proper labels and contain what their labels say. The announcement is accompanied by instructions for public comments. Despite the new rules, nutrition supplements are still wildly unregulated by comparison to drugs. Under a controversial 1994 law known as the Dietary Supplement Health and Education Act (DSHEA), Congress denied FDA the power to regulate existing dietary supplements as pharmaceuticals and prevented FDA from requiring manufacturers to prove that supplements are safe or effective (see the mildly stated FDA view of this limitation and a quote from the Consumers Union). Leading nutrition researchers, such as Alice Lichtenstein and Robert Russell here at the Friedman School of Nutrition at Tufts University, have spoken out with increasing vigor in recent years about the importance of getting nutrients from real foods (see a scholarly statement of their views and a Tufts news article).